Traditional Homes & Interiors - The Swimming Pond Company Ltd. Swimming ponds provide a natural environment for plants and animals and improve the biodiversity of the garden. Blending naturally with their surroundings, they are a world apart from the chlorinated pool we have grown so used to. Planning permission for a swimming pond is not normally required but it is advisable to check with the local planning department, especially if you live in a conservation area or are the owner of a listed building. Designing a natural swimming pond is a matter of personal taste, the shape and size is flexible. The swimming pond could have a formal shape and appearance with a paved or brick edge, or you could opt for a fluid informal shape, with grass or gravel to the edge – or a combination of the two. There could be a beach style entrance at the shallow end, with decking or paving at the deep end to allow swimmers to dive in and with a wooden or steel ladder to climb in and out. Locating the pond at the lowest point in the garden affords a natural feel and designing it next to a terrace or deck gives one the impression of sitting beside a lake. Aesthetically and practically it should be built as close to the house as possible. Due to the variable weather in the UK, there can be days when one does not necessarily want to swim, but a swimming pond positioned close to the house offers the opportunity to enjoy the enriching experience of simply being close to water without having to take a hike to get there. When it comes to building the swimming pond, it is recommended that it is constructed on well-compacted ground. This is particularly important on sloping sites where an engineer’s calculations of the ground loading should be sought. The correct building method is extremely important since the swimming and regeneration zones must be clearly separated. There are a number of ways to achieve this, such as block walls, timber or sandbags. The correct relationship between the swimming area (plant free zone) and the regeneration zone requires careful balancing. A concrete screed is usually laid on the floor of the main swimming area. An artificial liner together with an underlay to protect the liner would ensure that the structure is water tight. The aquatic plants carry out a biological cleaning process of the water. Not only do they look attractive but they produce oxygen and remove excess nutrients from the water. The plant roots and gravel in which the plants are growing harbour micro-organisms and bacteria which all play a part in the cleaning cycle. In order for the swimming pond concept to work efficiently if is vital the aquatic plants are carefully selected. The regeneration zone is essentially devoted to growing a range of aquatic plants. There are deeper areas for water lilies and oxygenators and shallow areas for marginal plants. The container grown plants are placed in gravel of varying size to promote root growth since excess soil encourages algae growth. Maintenance is normally less than that of a conventional, chemically controlled pool. However, plants should be kept in check by cutting back where necessary and removing old plant material in late autumn.Although it is a natural pond and the odd piece of debris does not look out of place, it is advisable to keep a net at hand, especially if you have a lot of trees. It is important to vacuum it at least once a year, normally after the autumn leaf fall. Before the start of the swimming season any silt should be removed from the swimming area. Swimming ponds with a surface area of between 120 – 180m are a good workable size but can be larger. If the pond is smaller, the self-cleaning is less effective without mechanical help such as the use of filters. The bigger the pond is, the better it is for the biological balance. Even intensive swimming will not disturb it. It may be a good idea to install an outdoor shower as an excess of natural body oils and sun tan lotion can interfere with the balance of the water. 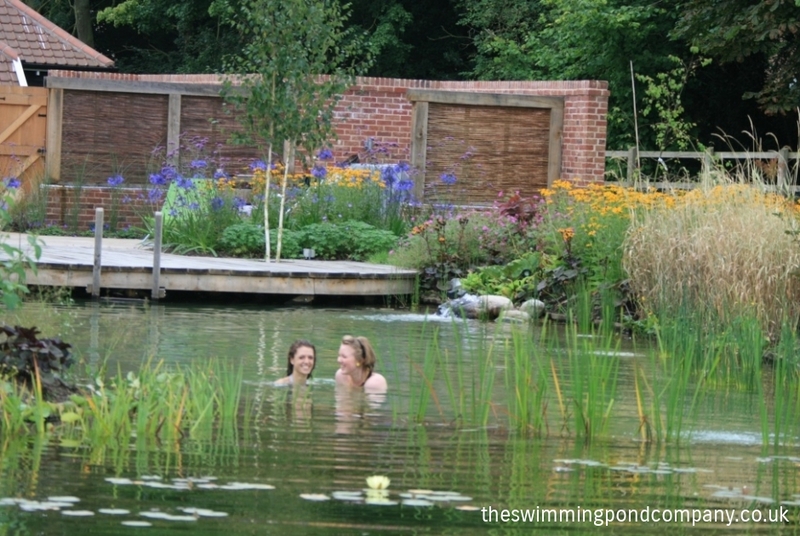 The first UK swimming pond was built at the Hampton Court Flower Show in 2001. Since then many more have been built throughout the country as the trend toward environmental consideration continues. For those people considering such a project The Swimming Pond Company encourages you to visit their show swimming pond in Norfolk and may be contacted on 01379 688000. The swimming pond featured above can be visited by appointment. Registered in England and Wales, Company No: 6250648. VAT Reg. No. 8903749 91.